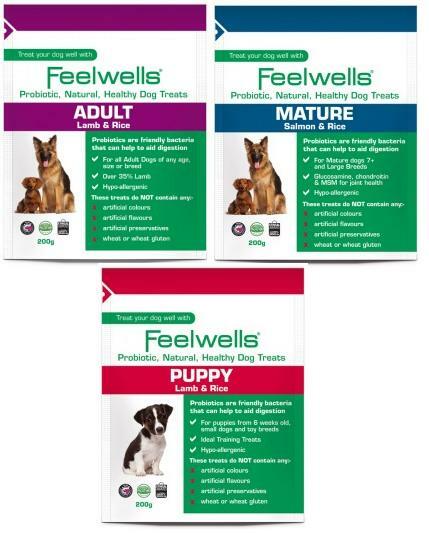 Feelwells is all about treating you dog, but primarily making his health the main focus. All their treats are designed to benefit your dog's health and improve things such as joints in addition to encouraging healthy skin. Each treat contains specific probiotics which keep their digestive system balanced. This enables them to take more nutrients from their food so there is less waste. This enables firmer stools, better breath and less gas. Perfect for dogs with sensitive digestions. The Adult and Puppy versions are lamb and rice while the Mature is salmon and rice. Do not contain any beef, egg, dairy, soya, wheat or wheat-gluten, artificial colours, flavours or preservatives, as these are known to cause digestive upsets in dogs. Whole rice (min 41%), Lamb meat meal (min 35%), maize, refined poultry fat, beet pulp, brewers yeast, poultry grave, fish oil, thyme, marjoram, oregano, parslely, sage. Probiotic: Enterococcus Faecium 1000,000,000 cfu per kg. Whole Rice (min 29%), Fresh Salmon (min 24%), oats, maize, salmon meal (5.5%), beet pulp, refined poultry fat, brewers yeast, fish oil, poultry gravy, minerals, thyme, marjoram, oregano, parsley, sage, glucosamine (185mg/kg), MSM (185mg/kg), chondroitin (130g/kg),Probiotic Enterococcus Faecium 1,000,000,000 cfu/kg. Whole rice (min 41%), Lamb meat meal (min 26%), barley,beet pulp, refined poultry fat, brewers yeast, fish oil, poultry gravy, thyme, marjoram, oregano, parsley, sage, Probiotic Enterococcus Faecium 1,000,000,000 cfu per kg. Crude Protein 20%, Fat Content 10%, Inorganic matter 8.5%, Crude Fibres 4%, Omega 3.093%. Vitamin A 13,885iu/kg, Vitamin D3 2,080 iu/kg, Vitamin E (as alpha tocopherol) 93mg/kg, Trace elements: ferrous sulphate monohydrate 154mg/kg, zinc sulphate monohydrate 129mg/kg, manganous sulphate monohyrdrate 101mg/kg, calcium iodate anyhdrous 1.52mg/kg, sodium selenite 0.62mg/kg. Crude Protein 18%, Fat Content 8%, Inorganic matter 4%, Crude Fibres 3%, Omega 3 0.93%. Vitamin A 13,885iu/kg, Vitamin D3 2,080 iu/kg, Vitamin E (as alpha tocopherol) 93mg/kg, Trace elements: ferrous sulphate monohydrate 154mg/kg, zinc sulphate monohydrate 129mg/kg, manganous sulphate monohyrdrate 101mg/kg, calcium iodate anyhdrous 1.52mg/kg, sodium selenite 0.62mg/kg. Crude Protein 22%, Fat Content 10%, Inorganic matter 8%, Crude Fibres 3%, Omega 3 0.93%. Vitamin A 13,885iu/kg, Vitamin D3 2,080 iu/kg, Vitamin E (as alpha tocopherol) 93mg/kg, Trace elements: ferrous sulphate monohydrate 154mg/kg, zinc sulphate monohydrate 129mg/kg, manganous sulphate monohyrdrate 101mg/kg, calcium iodate anyhdrous 1.52mg/kg, sodium selenite 0.62mg/kg. Below are some recent questions we've received regarding Feelwells Probiotic Dog Treats, including answers from our team. How many treats are there in a packet please? I want to know how long a packet will last if I'm feeding my 27kg elderly labrador 8 treats per day. There are 120 treats in the mature bag.